The coupled entry of Still Krz (#1) and Story to Tell (#1A) figures to go off at a very short price. However, I’m not in love with either of them and would rather not bet them as underlays. Still Krz had everything his own way while racing on the front end last time (note the pace color-coded blue), and I don’t think the effort was quite as strong as it seems. 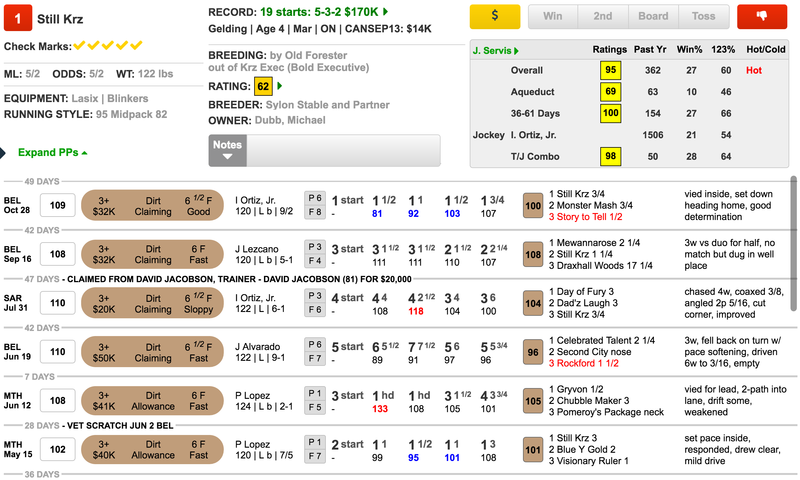 Story to Tell earned a fast speed figure in his recent victory, but he also got an absolutely perfect trip in a race where others had trouble. I want to take a shot against them with GENTRIFY (#8), who is faster than both of them early, if Jose Ortiz decides to use his speed. 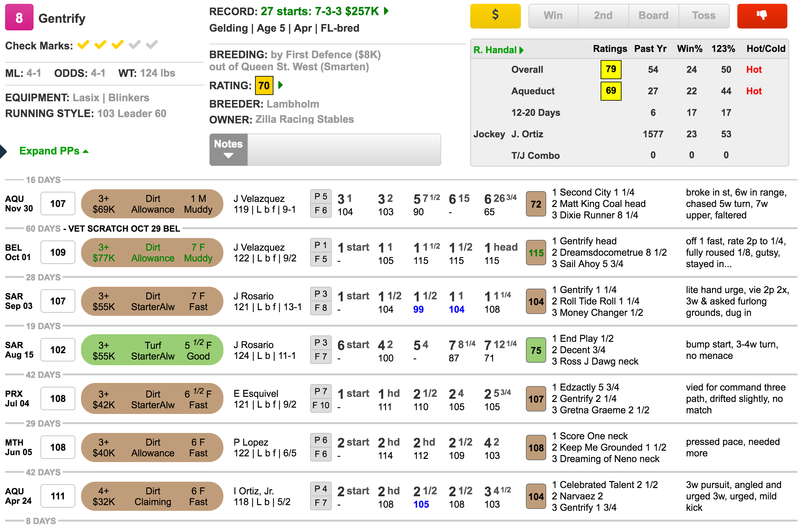 This horse is dangerous when left alone up front, and the Pace Projector is predicting that he’ll be leading this field in a situation favoring the frontrunner. He was overmatched last time, but his prior efforts, when beating Dreamsdocometrue and Roll Tide Roll, would make him awfully tough to beat today. Others to include are Rockford (#2), who figures to move up off the claim by Danny Gargan but may be hard-pressed to stay with the speedier Gentrify early; We Did (#3), who was overmatched last time but had previously been in career form; and Adirondack Posse (#4), who ran deceptively well after a poor start last time.